We had our annual Christmas breakfast morning and Santa visit for all the pupils on Friday 21st December. The Parents Reps had a yummy breakfast of sausages and rolls for the pupils with teas/coffees and treat for visiting parents. A huge thank you to all involved. It was a great way to start off the Christmas holidays!!. The BOM and staff would like to wish all our pupils and their families a very happy, safe and peaceful Christmas. See you all in January. The children in the Junior room have taken part in a colouring competition ran by the Arklow Municipal Council. A winner will be chosen from each school and their pictures will be displayed in shop windows in Arklow Town. This will be an exciting event with singing and a fireworks display. The parents Reps, parent volunteers and the Board of Management are working really hard to ensure that this years fundraiser is a huge success. The much needed funds raised will be used for necessary resources in the school, and to ensure that the school building is maintained to a good standard. This years event promises to be a great night. We have a spooky Halloween walk, followed by a disco and some brilliant raffle prizes. We are encouraging all children and their parents to dress up on the night. A family concession ticket will be issued on Thurs 25th Oct prior to the event which entitles all pupils to enter with their family free of charge. The fundraiser is open to all families outside of the school so feel free to invite all your friends and family to join us. There will be a very reasonable €5.00 entry for families outside of the school. Below is a list of great prizes already donated. A full list of prizes will be available in the next few days. Please remind all children to get busy filling their Fundraising Cards as prizes will also be available for each class group. Cards are not due to be returned to school until after the midterm break on Weds 07th Nov to give everyone the opportunity to raise as much as they can. Thank You for your cooperation and to all those who are giving their valuable time to help out before and on the night. It is much appreciated. We hope everyone enjoys the Fundraiser! It has come to that time of the year again, where we reflect on all the successful projects, initiatives and intra-curricular activities that was carried out in our school. As you are all aware a lot of work went into the teaching and learning of the Peace Proms songs and actions. The children and parents truly enjoyed the wonderful, once in a life time experience where treasured memories will be relived in years to come. A big ‘Thank You’ goes to Ms. Brennan for all her hard work in completing our project for Discover Primary Science & Maths, normally schools that enter receive a certificate in their first year but the wonderful work that the children produced enabled us to be awarded a Plaque! Ms. Fitzgerald is responsible for the Active School Flag and all the children and staff have engaged in the steps, we are now more than half way through this programme and we hope in the next academic year to successfully obtain the ASF. We thank Ms. Fitzgerald for her continued support and guidance in this wonderful intra-curricular activity. Yoga in the last term was greeted with open arms and the children truly benefitted from this activity. Our Roald Dahl workshop allowed the children to explore and expand their literacy thinking and “We are Writers” book resonates this. The children thoroughly enjoyed their I.T. classes with Ciaran Coughlan and the benefits of these classes are replicated in the high standard of power point presentations in their project work. Our Scholastic book fair was a great success and this is because of the parents of SSE and the wider community involvement. I’d like to thank the parent class reps for their time, support and help during the school year. A big ‘Thank You’ goes to the parents who volunteered during the Bag Packing Fundraiser and other activities throughout the school year. A special ‘Thank You’ goes to our secretary (Mary), cleaner (Caroline) and caretaker (Maurice) for their dedication and great efforts in supporting the running of the school. Well done to the true stars, the pupils of SSE. Every visitor that comes to our school and when we take trips outside of school, we are always complimented on how well mannered and well behaved the pupils are. Our Departmental subject inspection in Science 31st of May, was a golden opportunity for our pupils to shine. We are very proud of our report not only as our first published report but to be recognized of all the hard work that goes on in our school. This report may be viewed in the Inspectorate section on the Department of Education and skills website. We look forward to exciting times ahead for SSE so expect building works during the summer months, where we will be welcoming an additional new classroom. We wish Ms. Brennan and Ms. Doyle the Best of Luck as they are moving on from SSE. May the lovely weather continue and may I ask the children/parents to be mindful of their safety during the summer holidays especially around water. We would like to engage children in a reading challenge. All pupils in the school, including Junior and Senior Infants, are invited to take part in our Scoil San Eoin Reading Challenge where they read, or listen to an adult read, 6 or more of the following books. There will be a form in your child's homework folder next week where they can record the books that have been read and be in with a chance to win a €15 book voucher. The winner will be announced during book fair week. A book about an animal. A book with a female hero. my name is Philip Hamilton and I am an academy coach with the wdsl (Wicklow district schoolboys/girls league ) . We in the league oversee all underage soccer played in the county , as part of our continued development we have started an all girls academy at under 10 - under 12 & under 14 . Girls soccer is the fastest growing sport in Ireland at the moment and we would like to offer all girls in Wicklow the opportunity to come to our next open training session in east Glendalough school Wicklow town this Sunday feb 11th from 4.30 pm to 6pm . This is a great opportunity for girls who are either currently playing soccer or those who wish to start and get coached by our group of qualified - garda vetted coaches . January saw the exciting arrival of some new pe equipment in the school. Look how we have been making great use of it already. We would like to remind parents that access to the school via the back door before and during school is not permitted for health and safety reasons. This door is for pupils and staff members only. All parents and visitors to school must buzz either the office or a classroom, at the front door. We would also like to remind parents/guardians to check whether the issues they bring to the class teachers attention before school may be written on a note or email. If parents/guardians have an issue that they need to speak to the class teacher about, they should make an appointment via email or through Mary in the office. We would like to reiterate that morning time is a valuable time for staff members to get ready for the day ahead either by gathering resources etc or discussing issues with other staff members. We ask that parents/guardians are respectful of the points above and are mindful of the impact disruptions, and visitors in the school building during these times, have on the pupils day and also their health and safety. We thank you for your cooperation in this matter. Santa came early to Scoil San Eoin, with the delivery of a gorgeous handmade buddy bench from Billy Russel (Granddad to David and Jack Browne). It was a lovely surprise for the pupils, and will be something which will encourage the pupils to check on each other to make sure everyone has someone to talk to and is feeling alright, and also make sure that no one is upset or alone during break times. We're sure this bench will hold plenty of interesting conversations during its time in Scoil San Eoin! Thanks again Billy for sharing your talent and craftsmenship and your generosity to the pupils. A Great Night had at the Christmas Concert! A fantastic night was had at the annual Christmas concert. It took on a slightly different format this year with a beautiful performance from the Brittas Bay choir. The pupils from all three classes did their parents and teachers proud on the night with their performances, and even got a chance to join in with the Brittas Bay choir for some carols at the end. A huge thank you to all that made it such a fun and festive night, including the choir, Parents Reps and parents, raffle prize sponsors and those who donated refreshments, members of the BOM and staff of the school. A huge thank you also to Susan and Roland for the use of the hall and audio equipment for practices, and on the night. The final tally is not in yet but approx 1100 euro was raised on the night for the school! Videos of the show and the choir will be uploaded here in the week to come. The annual Christmas concert is taking place tomorrow night Dec 13th at 7.30. We hope to see all parents/guardians and extended families there for what promises to be a great night of Christmas cheer, with a special performance from the Brittas Bay Choir! Here is some information for the night. Senior pupils from Ms Greene's and Ms Nuzum's class are to be at the hall for 6:45 for a practise with the Brittas Bay choir. Junior pupils are to be there for 7pm. 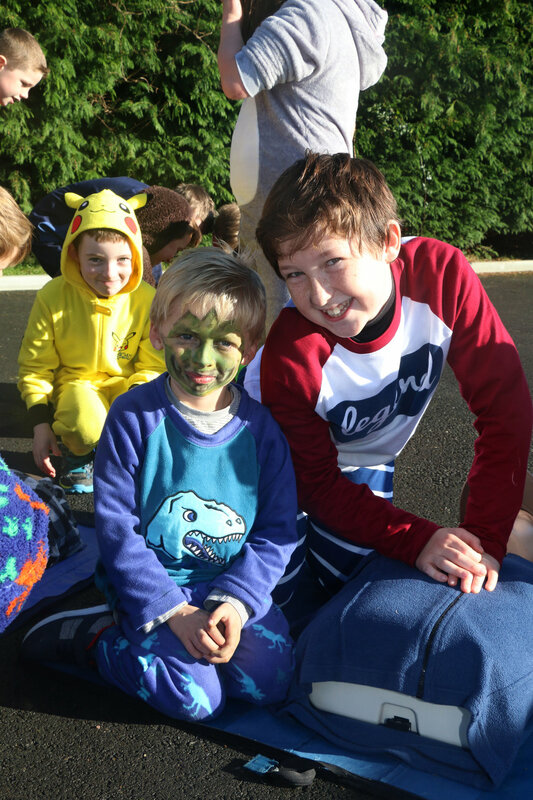 All pupils are to arrive in full costume, with their props, ready to go on stage. Any last minute raffle prizes can be dropped into the school office tomorrow. Any donations for refreshments can be given to the Parent Reps.
A huge thank you to the parents who volunteered their time to clean up around the school and the garden over the weekend. Their energy and enthusiasm meant that the place looks fantastic and it was very uplifting for pupils and staff to arrive on a crisp winter morning to see the place so tidy and maintained. Hopefully with their efforts and the addition of a caretaker in the New Year, the school will be back to its previous glory! Thanks again to : Helen and Thomas Browne, Cathy Nolan, Michelle Redmond , John Cleary and Patrick Brennan, Jill Power and John Breen. 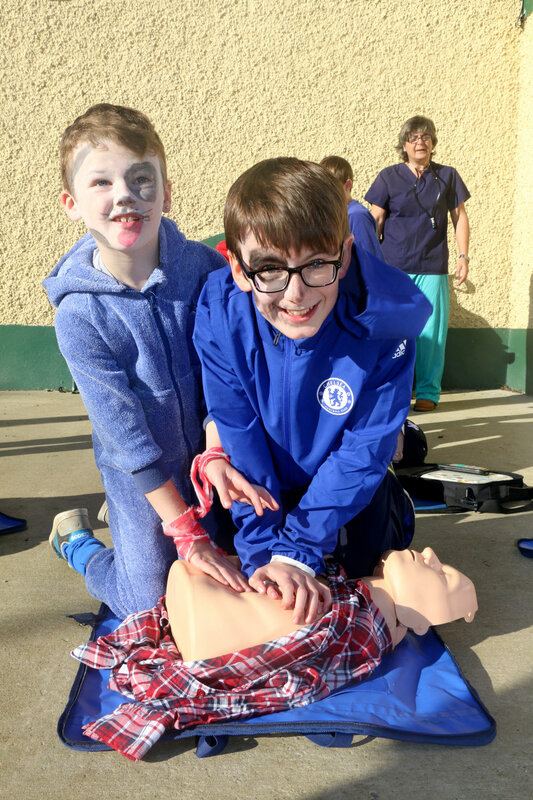 The children from Junior Infants to Second Class had their workshop first, followed by third class to sixth class. The workshops was enjoyed by all and the pupils enjoyed the power point presentations, learning all about safety and singing the Safe Cross Code. Complimnetary safety gifts were given to the children. The Course Coordinator, Orlaith enjoyed her visit to Scoil San Eoin and her testimony speaks for itself, see below. Well done boys and girls! "I just want to say a sincere thank you to you and all the staff at Scoil Eoin, for allowing me to visit your school and for the kindness and hospitality that was shown towards me. The children in every single class were absolutely excellent ! Having visited many schools I have to say the manners, respect and engagement of your students was top class! I hope the students enjoyed my presentations and that you were happy with the service." Cash for Clothes - A Great Success! The Cash for Clothes Collection has been taken and the total has come to an amazing 400 euro! A huge thank you to the ladies, Cleo, Geraldine, Martina, Helen and Sandra, who organised it and braved the elements (while having a little fun!) to help sort and carry the bags of clothes. In total 118 bags were collected, with 5 rejected. This was a fantastic fundraiser for the school and thank you to everyone who donated. Cash for Clothes - Final Call!! The cash for clothes drive is finishing on Thurs 30th 10am. All bags will be collected between 10am and 11am and any bags dropped after this time will not be accepted. A huge thank you to all who have donated clothes so far. 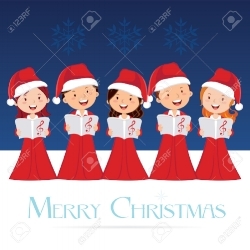 Our Annual Christmas Concert takes place on Weds Dec 13th @ 7.30 pm in the ' Trinity Hall Redcross'. 'Christmas around the world: The Real Saint Nick'. There will also be an exciting special performance on the night from 'The Brittas Bay Choir'. Refreshments will be available and a Christmas Raffle with amazing prizes to be won!! Admission will be €5.00 per adult on the night, with a raffle ticket for an entry prize included. All proceeds in aid of Scoil San Eoin. All are welcome to attend for what promises to be a great night!! Parent Teacher meetings will be held on Tuesday 28th of November. Each parent/guardian has been assigned a time slot with their class teacher and the Special Education teacher (if applicable). Please let the class teacher know if there is any issue with attendance at that time. The school will close for all pupils at 2pm on that day in order to facilitate the meetings. Parents/Guardians will be asked to enter the school via the back door and wait in the corridor until their time. When Ms Brennan is finished in her room, those waiting can move into there. 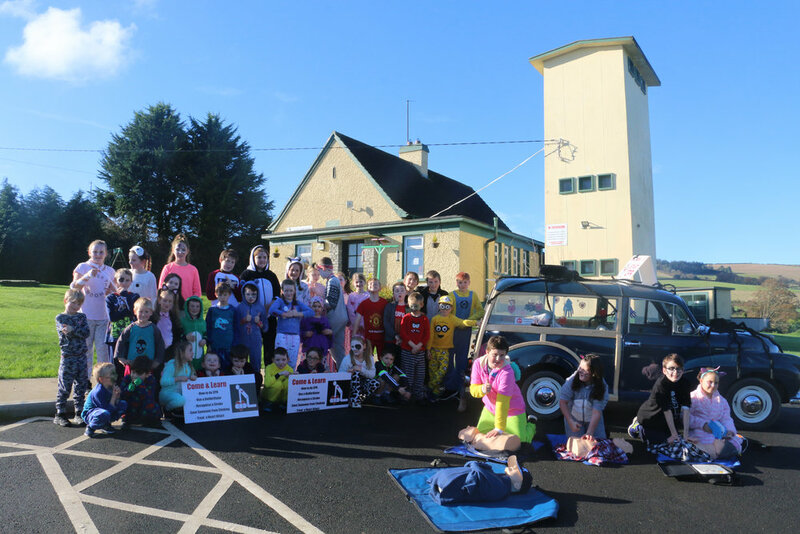 A huge thank you to eveyone who supported the Scoil San Eoin Halloween fundraiser on Sun 29th Oct. A great nite was had by all who attended and it was great to see everyone in costumes and having such fun. Thank you to all the BOM members especially Martina Wynne who headed up the organising and John Cleary for his amazing DJ performance (and impromptu dance!!). Thanks to Bernard Brennan who led the selling of raffle tickets, and all those who sponsored prizes on the night. Thanks also to the parents, Cathy Nolan, Karen Tiernan, Laura Jones, Nicole Keogh, Charisse Van Kan and of course all the well dressed Dads, who helped in setting up, cleaning up, organising games and distributing sweets (in their unique way!). A great team effort meant that the night was a great success and fun for all!. We are very grateful to the pupils who raised much needed funds for the school through the sponsorship cards, and these, combined with the raffle on the night, netted a total of 1450 euro. Thank you to all involved and we hope to do it again next year. 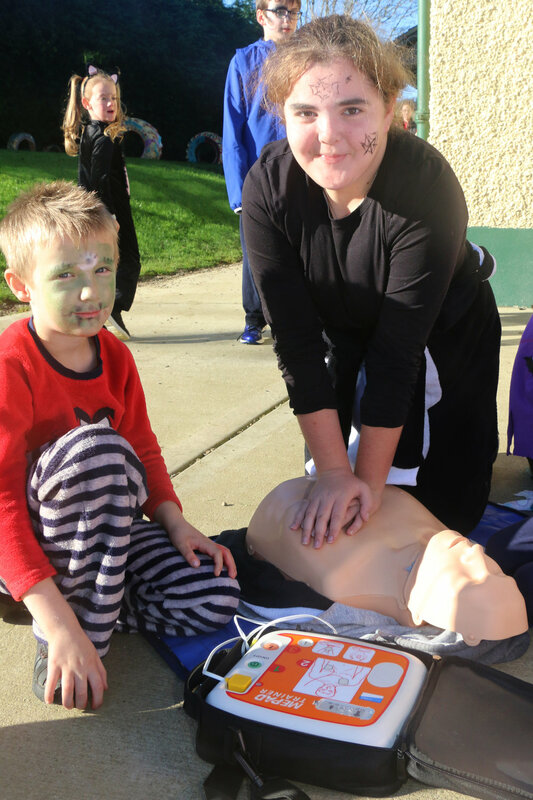 A fantastic day was had on Fri 27th when all the pupils dressed in 'scary' PJs to get in the Halloween mood, but also to raise funds for the local First Responders and the equipment that they need to maintain. 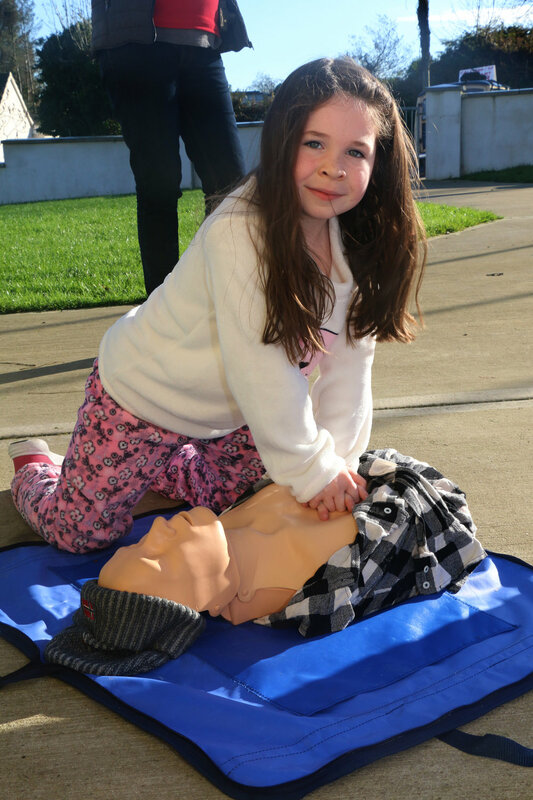 Pauline Nolan came with Peggy the car, and set up the First Aid equipment so the pupils could practise their skills. In total 114 euro was raised. It was also a good way of getting recognition for all that Pauline and the other First Responders do on a volunteer basis and also to say thanks for sharing her knowledge with the senior pupils each year. We hope to have Pauline back again to run her usual classes later in the year. A huge thank you to those who put themselves forward for the position of Parents Rep for a class grouping. This will be a great means of communication between school and home. See list below. A meeting will be held after the Halloween break to discuss how best to move forward with the new format. A huge thank you also to the other parents who put their names forward to volunteer throughout the year for various activities. We thank you for giving up your time and look forward to having you work with us in the school.